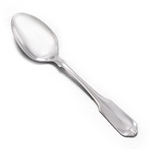 Gloria by Oneida, Stainless Sugar Spoon, Also Known As: Montclair, Active Pattern: No, Circa: 1989, Size: 6", Used for serving sugar. Gloria by Oneida, Stainless Place Soup Spoon, montclair, Active Pattern: No, Circa: 1989, Size: 6-7/8", Used for various types of soups and some desserts. Gloria by Oneida, Stainless Master Butter Knife, Also Known As: Montclair, Active Pattern: No, Circa: 1989, Size: 6-3/4", Ideal serving piece to slice and serve butter onto your plate. Gloria by Oneida, Stainless Cold Meat Fork, Also Known As: Montclair, Active Pattern: No, Circa: 1989, Size: 8-3/8", Used as a serving piece on meat platters. Gloria by Oneida, Stainless Dinner Knife, Also Known As: Montclair, Active Pattern: No, Circa: 1989, Blade Type: Serrated, Size: 9", The largest knife in the place setting, ideal for cutting your entrée. Gloria by Oneida, Stainless Tablespoon (Serving Spoon), Also Known As: Montclair, Active Pattern: No, Circa: 1989, Size: 8-1/4", Used for serving vegetables, fruits, or casseroles. Gloria by Oneida, Stainless Dinner Fork, Also Known As: Montclair, Active Pattern: No, Circa: 1989, Size: 7-3/8", The largest fork within a place setting, used for eating your main entrée.